"This is the perfect mascara to add length with the first application and glamorous volume with the second. And by using the waterproof shade for those cold windy and rainy mornings will guarantee you long lasting full lashes without smearing! 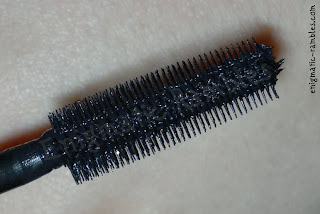 This style of brush is made of rubber, with tiny little teeth evenly spaced along the head - perfect for separation and definition!" For £3 I think its worth it for an everyday mascara, not something I would rush out for if I was wanting mega volume though.